Ellsberg: Take Obama’s explicit pledge in his State of the Union speech to remove “all” United States troops from Iraq by the end of 2011. That’s a total lie. I believe that’s totally false. I believe he knows that’s totally false. It won’t be done. I expect that the US will have, indefinitely, a residual force of at least 30,000 US troops in Iraq. This is crazy. Criticizing Obama’s willingness to keep troops in the Middle East is fine. But claiming that he’s lied about it? That’s pretty much the exact opposite of what’s going on. On February 27th of last year, just a month after taking office, Obama gave a major speech at Camp Lejeune and announced that all combat units would withdraw from Iraq by the summer of 2010 but he’d be keeping a “residual force” in Iraq comprising about 50,00 troops. He was crystal clear about this, aides who briefed reporters later were crystal clear about it, and he took plenty of heat for it. It’s been a subject of intense controversy ever since. Ellsberg acts as if he’s speaking truth to power on a subject the establishment has continually denied, but it ain’t so. All he’s doing is repeating what the establishment itself has said time and time again. 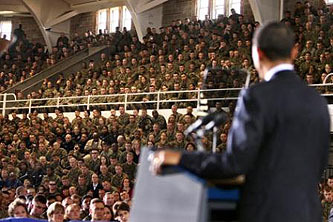 As for this year’s State of the Union speech, what Obama said was this: “We will have all of our combat troops out of Iraq by the end of this August….This war is ending, and all of our troops are coming home.” So yes, he used word “all.” But he also made it clear that he was talking about “combat troops,” as he always has, and the administration position on the residual force remained the same. There’s no skullduggery here. UPDATE: Sorry, I misread this. Ellsberg is talking about the end of 2011, at which time Obama has indeed promised to withdraw fully from Iraq. Calling this a lie is still pretty far over the top, though, unless we get to the end of 2011 and it turns out that Obama has refused to keep his word. So far, however, withdrawal has happened on exactly the schedule he outlined last year. And nothing in this year’s State of the Union speech said anything about 2011.